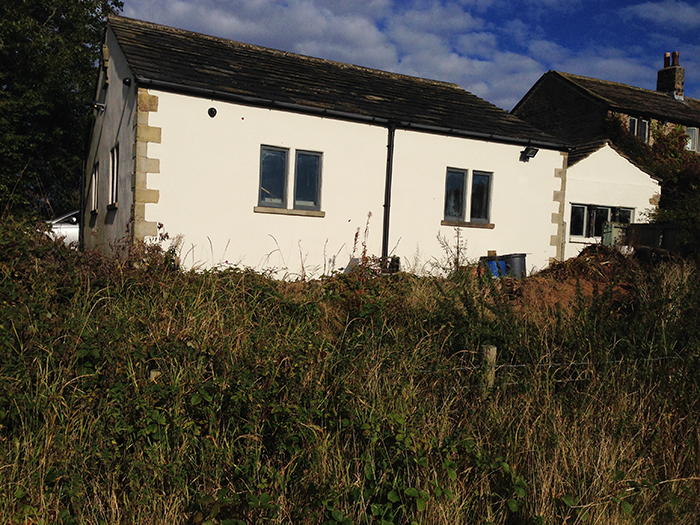 Earlier this year we had the opportunity to re-design an unused area of a traditional Yorkshire cottage in Little Lepton. The site boasted widespread views across rolling fields with Emley Moor television transmitter as an ever present focal point. The clients were a young couple with a baby and wanted an area of the garden that they could use for entertaining and relaxing. The design should be sympathetic to the traditional and local vernacular with a contemporary feel. Views off site should be preserved and borrowed into the scheme. The area should be large enough to entertain a sizeable number of people. The space should be child friendly. Provisions should be made to accommodate a hot tub. 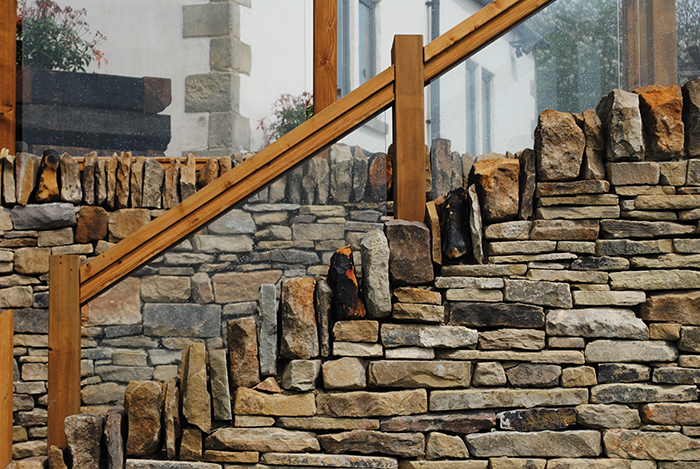 The site had a serious level change from the building into the field so the decision was made to create a balustraded deck area flanked by a curving drystone wall. 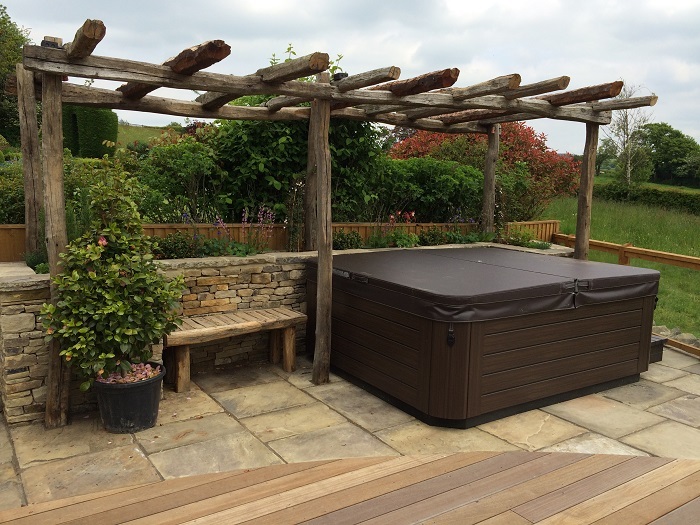 A pergola and raised bed constructed from Yorkshire stone in a drystone style would enclose the hot tub with a stone flag surface. 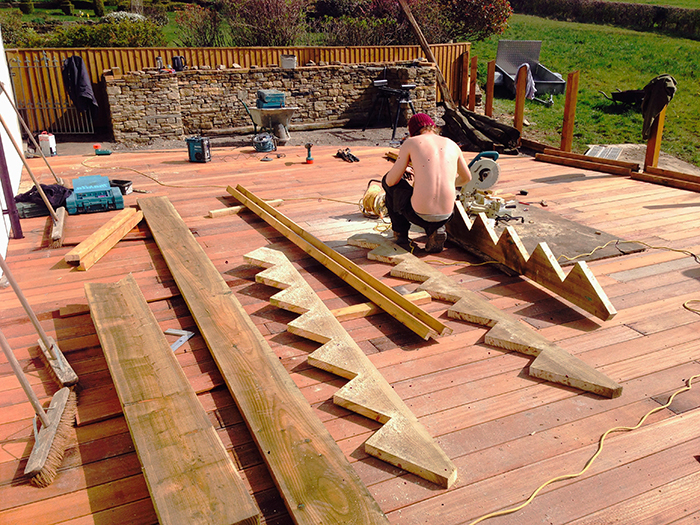 A set of steps biting into the deck would serve as a direct link into the field. 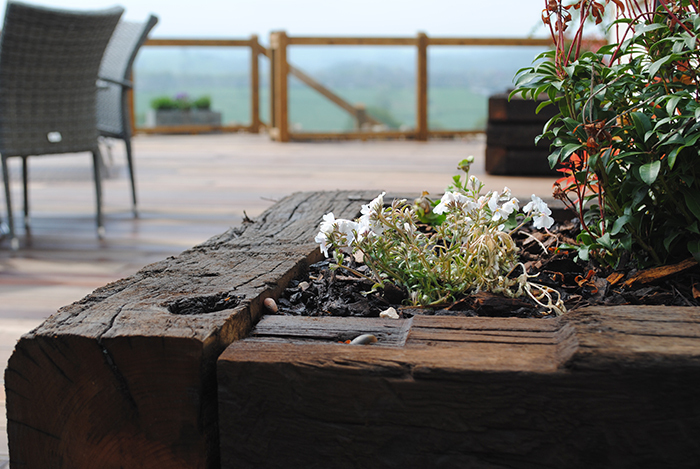 During the clearance stage we managed to salvage a number of reclaimed oak sleepers that we later used in the pergola and as an edging detailing down the side of the garage. 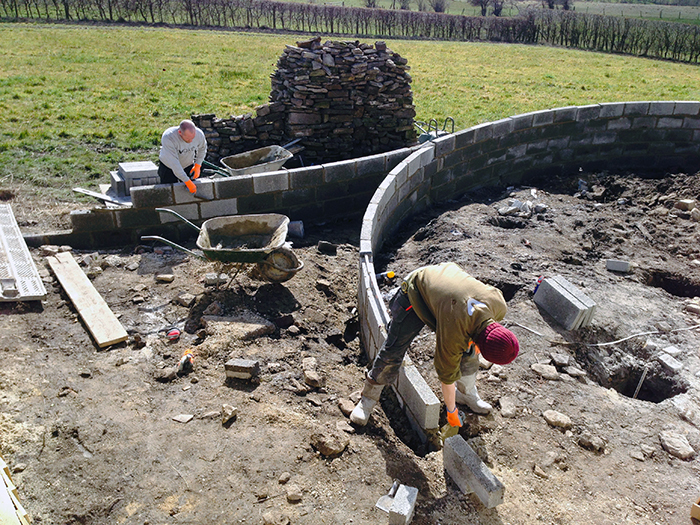 The existing dwarf wall along the field was dismantled and the stone was salvaged to be later reused. Since the wall was to carry the deck in part, we had to build all of the walls first. 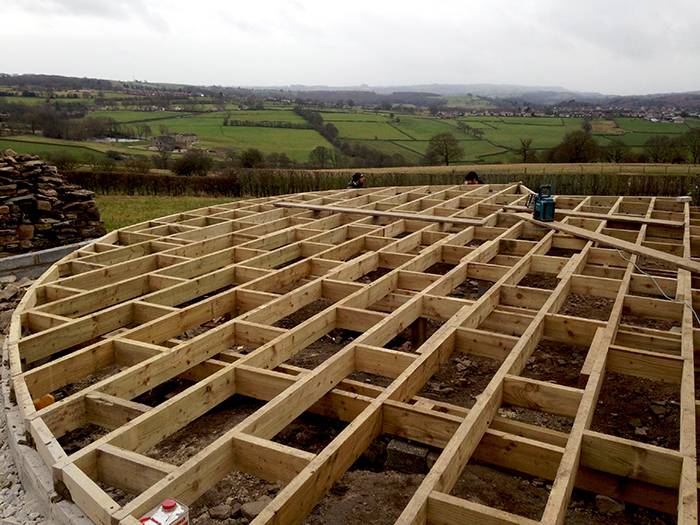 The framework for the deck was then constructed. 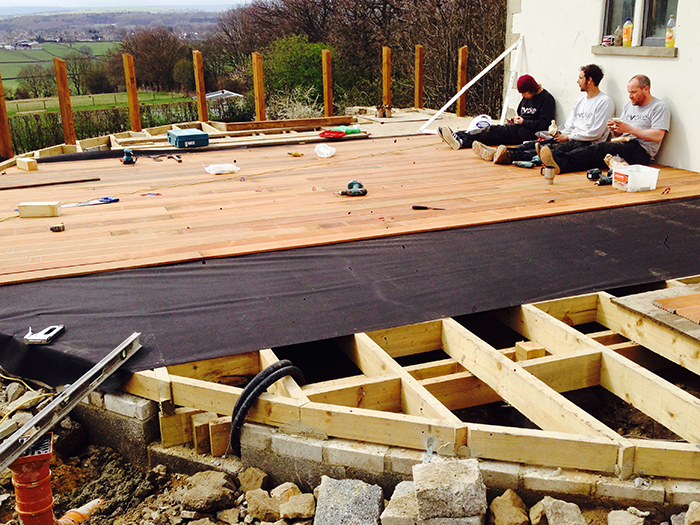 Sleeper walls under the frame were installed to break the long spans of the timber reducing any potential bounce and flex. At this stage of the build we installed the posts that would carry the glass balustrade as well as running cables for a lighting scheme. 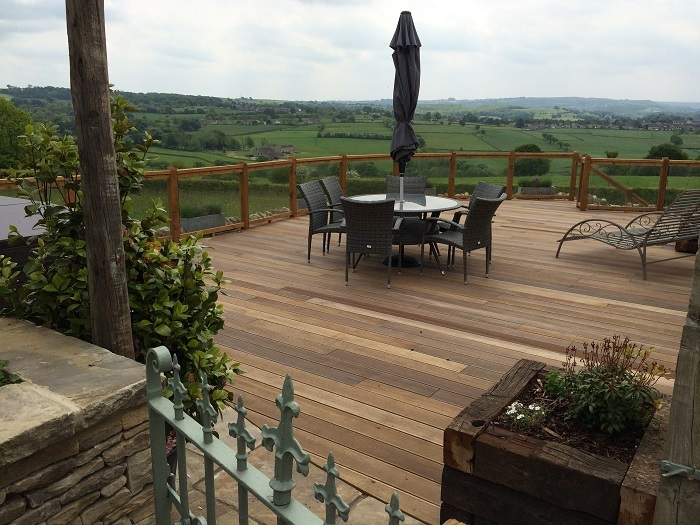 We decided to clad the deck with a hardwood called Balau for its variety of warm tones and longevity. 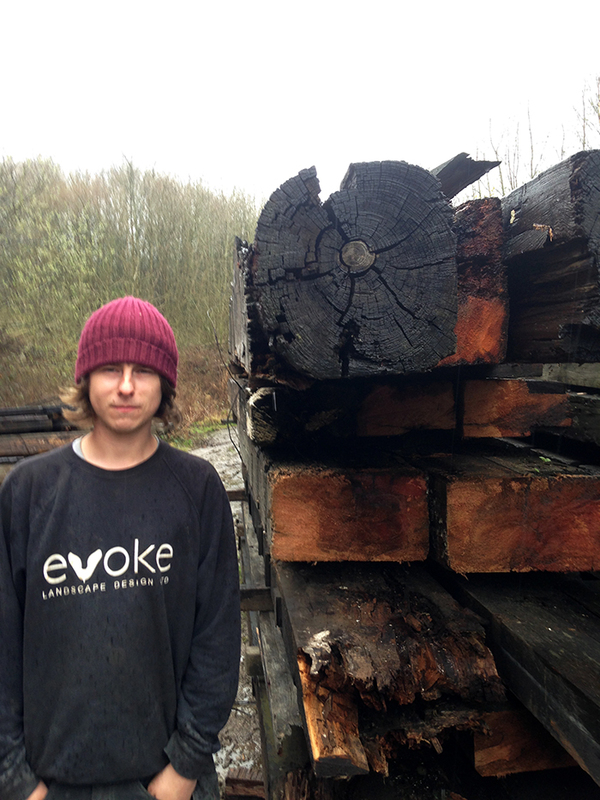 Cutting the curve and notching in around the posts proved to be a challenge. 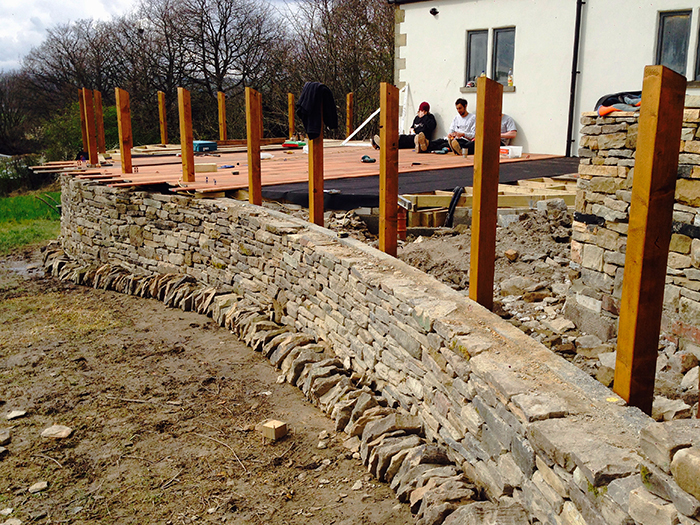 The walls were then faced with Yorkshire stone to give a drystone appearance. 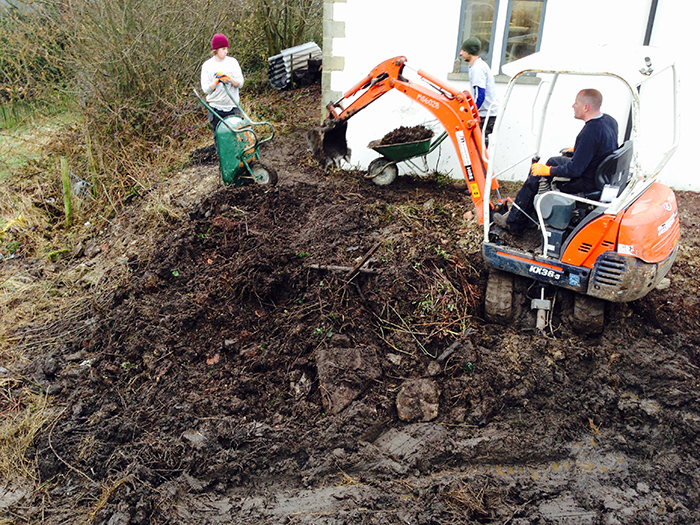 We had to bring in new stone to mix in with the existing stone on site. 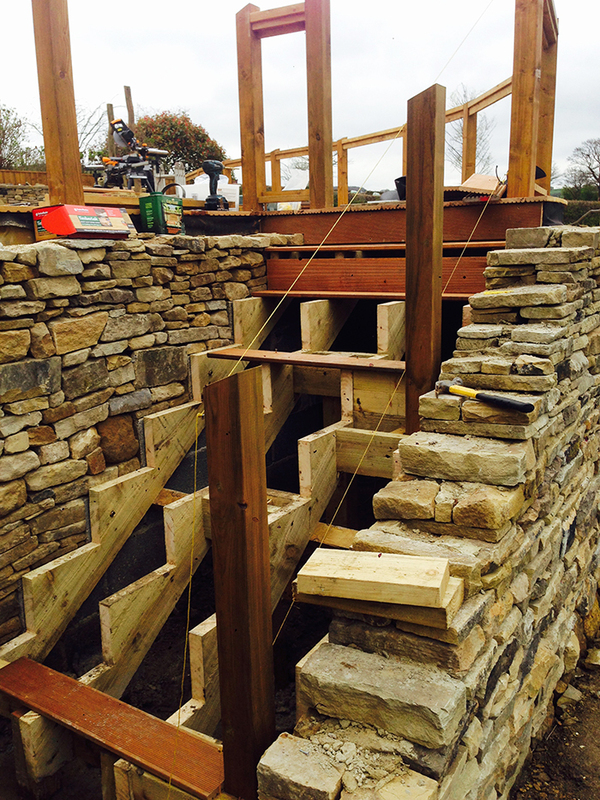 Over time the stone will weather and harmonise. The raised planter around the pergola and hot tub was constructed in the same manner. 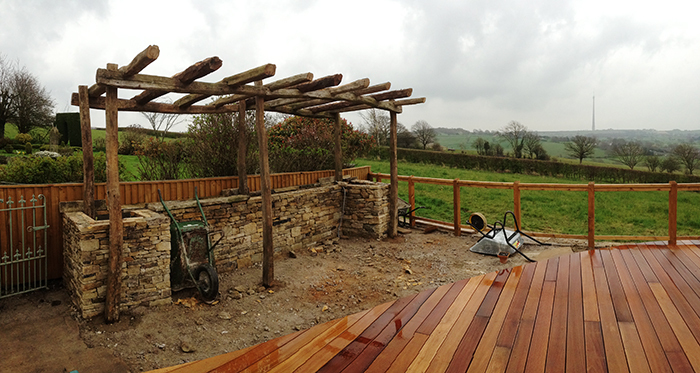 Prior to paving the hot tub area we had to build the pergola. 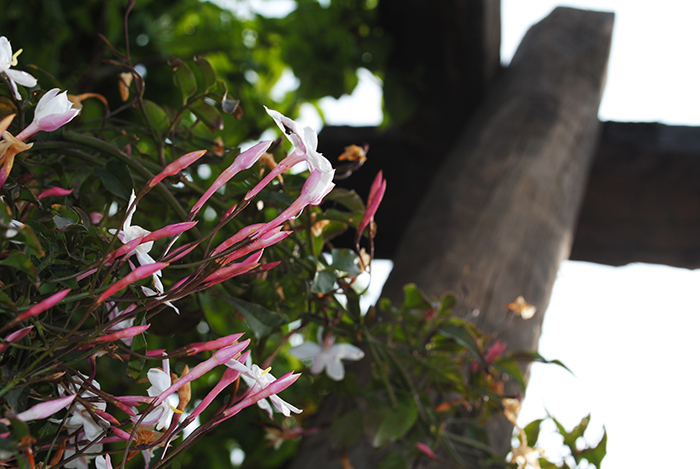 We wanted to juxtapose materials to create contrast so we decided to build the pergola using reclaimed oak sourced from a great reclamation yard in Guisley called W Machell & Sons Ltd. 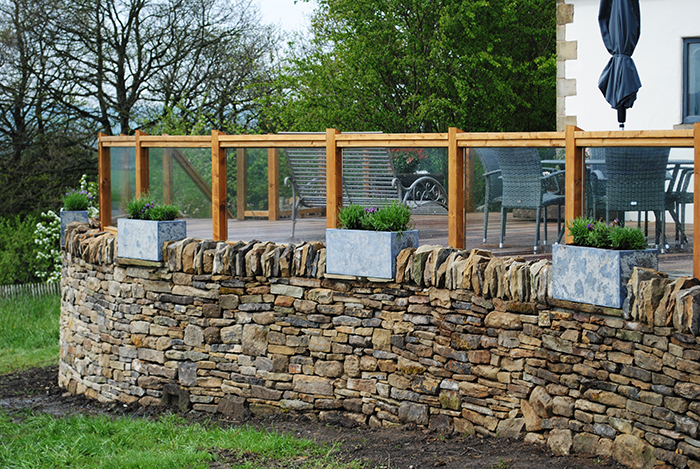 The decision was taken to use Yorkshire Stone flags to preserve the rustic charm of both the house and existing garden works surrounding. 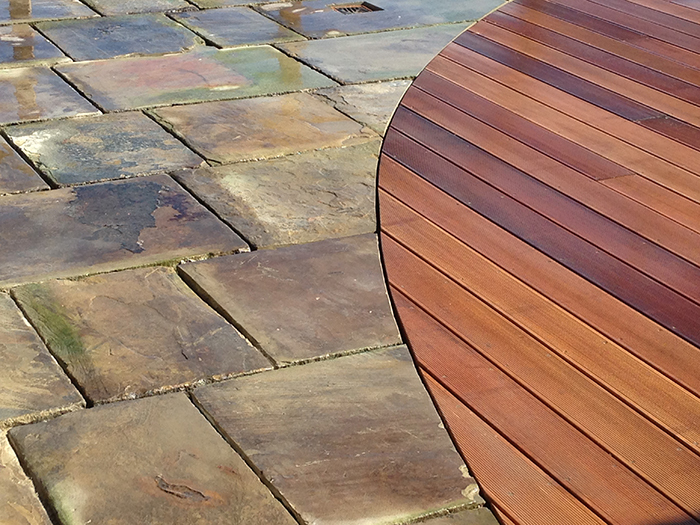 The slickness of the deck shape and finish really contrasted with the palette of reclaimed materials. 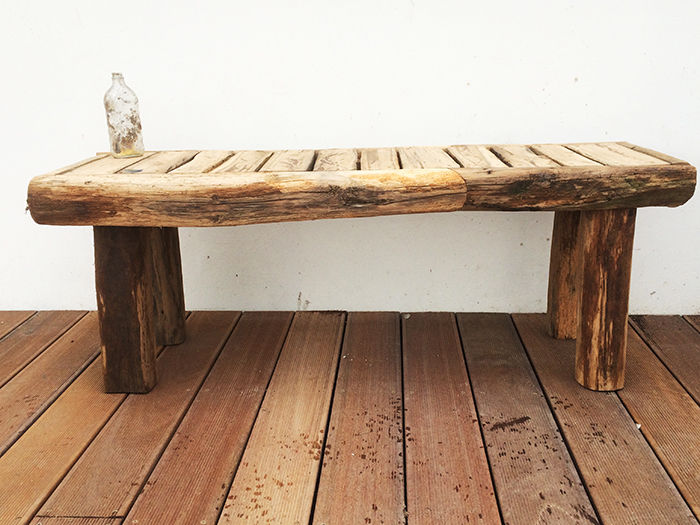 With the off-cuts of oak we decided to build a bench that could be moved around but would reside next to the hot tub most of the time. Westgate Glass & Mirror Co Ltd in Liversedge supplied the glass balustrade with a self-cleaning coating. We were very happy with the finished garden. 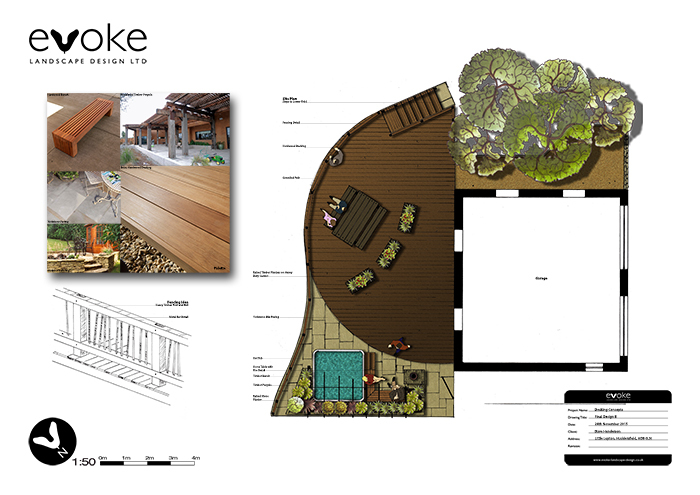 Its simple design and layout proved to be one of our more technically challenging projects. We look forward to seeing the space at night with the lights on.